2. 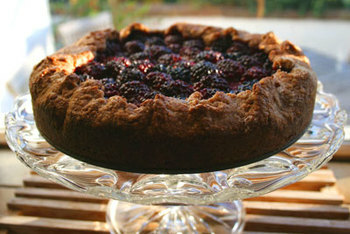 Picking apples and blackberries for this pie, my favourite pie. I adapted Tessa Kiros' Wholemeal Apricot Pie with the fold over crust from this beautiful book. I used apples and blackberries instead of apples and apricots, spelt flour instead of wholemeal because spelt has a lovely nutty taste and I made the crust a bit bigger to make it easier to get into the pan. 3. Children back in school, the serenity, and drinking a whole cup of tea before it gets cold. Oh, that IS gorgeous...I will put that book on my shopping list!